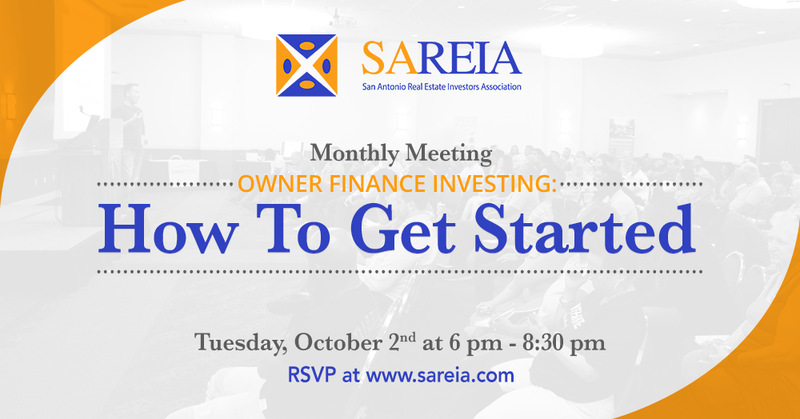 San Antonio Real Estate Investors Association - Monthly Meeting- " Owner Finance: How to Get Started"
Monthly Meeting- " Owner Finance: How to Get Started"
Please join us as we discuss how to get started with owner financing. Owner financing means that the person who sells the real estate agrees to take payment over time for the purchase price of that real estate. For example, if you buy a house from a seller and the seller agrees that you can pay $1,000 per month over 30 years, this would be owner financing, also called seller financing. SAREIA is also a terrific place to network with like-minded folks and build your real estate investing team. Several vendors will be in attendance to answer questions about private money, title closings, rehabs, buying wholesale deals, etc. Food is available for the early birds, first come first serve bases.